Posted on Mon 4 Aug 2014 at 7:47 PM PST. Filed under Recipes. 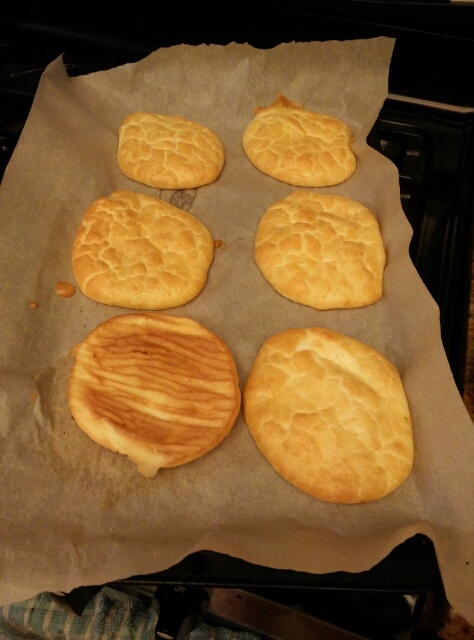 Oopsies are the Americanized version of the French souffle. My French husband loved them. They can be baked in ramekins for a more authentic souffle taste (in this case omit the almond flour), or as bread buns. They’re extremely low carb, and Paleo/Primal. 1. Preheat oven to 350 F (175 C). On the bowl with the whites, add the cream of tartar. 2. Beat the whites in high speed until very-very stiff, about 4-5 minutes. 3. Add the cheese and flour to the yolk bowl, and beat until smooth, about 1-2 minutes. 4. Fold the yolk mixture slowly into the whites, and mix carefully with a spatula for a few seconds. 5. Spoon the mixture in 6 pieces, on a baking sheet with a parchment paper. Bake for 15-20 minutes until golden brown. Serve immediately. Per Serving (3 buns): 430 calories, 3 gr of net carbs, 36 gr of fat, 25% protein, 83% Lysine. 45% B12, 72% Riboflavin, 63% choline, 55% A, 23% calcium, 59% phosphorus, 31% selenium, 33% copper.